Exciting news! We will be releasing Justin Stanton's long-awaited solo debut album, "Secret Place," on May 3rd! Pre-orders will be made available on April 4th, during the next episode of the "Artists Interviewing Artists" series at Highbreedmusic - The Artists That Artists Love hosted by fellow Snarky Puppy member Maz. Make sure you tune in at 8pm EST to learn more about this exciting project and catch the exclusive single video premiere of Justin's first single “What Do You Want!" The countdown is over. Snarky Puppy's 12th record, "Immigrance," is finally here! The 2nd track from "Immigrance" is here - in an animated, eye-popping way! Co-directed by animator Michaël Alcaras and Stella K, the surreal video for Snarky Puppy’s “Bad Kids To The Back” (written by Michael League Plays Music & Justin Stanton) turns an in-studio performance into a wild animated adventure. Thanks to Rolling Stone for premiering this hypnotic and visual work of art. Check it out here! Immigrance is available for pre-order here! House of Waters' New Record "Rising" Available Everywhere! House of Waters' new album, "Rising," is available everywhere today! Along with the release, we're happy to share the video for their song "When I Play." This tune started as a solo bass etude that Moto was working on while they were on the road with Snarky Puppy in Europe a few years back! The full album “Immigrance” drops March 15. A New Single for House of Waters! GroundUP Music artist House of Waters is releasing new music into the world! We are very excited to announce this fantastic band's new album "Rising" is now available for pre-order. Listen to the first single, Sting's " Shape of My Heart here! The album will drop on February 15th. Fans will have a chance to grab a physical copy of the record a few days early at this year's GroundUp Music Festival in Miami Beach! Additional Artists Announced For GroundUP Music Festival! The GroundUP Music Festival 2019 lineup just keeps getting better and better! Andrew Bird (full band set + 2nd set GUMFEST version of Andrew's “Live from the Great Room” with festival artists), Chris Potter Circuits feat. James Francies and Nate Smith, & Richard Bona (Artist At Large) will be joining us in Miami Beach, February 8-10, 2019. Snarky Puppy Announces Live Album "17"
Snarky Puppy is releasing a live album today. Limited edition of this exclusive 4 LP live album from the 2017 World Tour. “17” - Pre-order yours here! Here’s the first 2019 tour announcement of many to come! Snarky Puppy's US tour (part one) will be in May and June of next year to support their upcoming record, coming out in March. GroundUP Music Festival 2019 Lineup Announcement! The lineup announcement for GroundUP Festival 2019! Snarky Puppy will play a full extended set all 3 nights with 3 different lineups, and – World Premiere-- will debut the very first-ever live performances of music from its new, unreleased 12th album. Be the first to hear the new music! We hope to see you on the beach, February 8-10, 2019 – perfect weather in our oceanfront oasis, delectable food by celebrity chef Michelle Bernstein, unique access to the artists, small interactive workshops all weekend long (workshops to be announced soon), and great music! 2x Rock and Roll Hall of Fame inductee David Crosby with his Lighthouse Band (Michael League, Becca Stevens & Michelle Willis) can’t wait to see you at this year’s GroundUp Music Festival! GroundUp Music Festival - Tickets on sale! While we can’t announce the full line-up yet, we guarantee you that it will be phenomenal AND one more thing is certain. Snarky Puppy will be playing all 3 nights with 3 different lineups and it will be the World Premiere, the 1st Live performances of music from the new, unreleased album! Tickets + Hotels are on sale now! Check the 2018 recap right here! Bokanté Releases First Music Video for Upcoming Record, "What Heat"
Bokanté’s first music video “All the Way Home” is out and it’s beautiful. Listen, Share, and Support these incredible musicians! Official Video for Sirintip's "In My Garden"
In case you haven’t checked out Sirintip’s debut album (or even if you have), put your eyeballs on this music video from the half-Thai/half-Swedish phenom. Directed by Derek Means. What if you could make the world a better place by planting glowing seeds in the darkest of places? What if these seeds turned into beautiful flowers that grow and turn the world into the most colorful place you’ve ever seen? Charlie Hunter Trio (Feat. Lucy Woodward and Keita Ogawa) Release Video Of "Spoonful"
GroundUP artists Charlie Hunter and Lucy Woodward join Snarky Puppy and Bokanté percussionist Keita Ogawa for a rendition of Willie Dixon’s “Spoonful” on their last tour. The Charlie Hunter Trio starts a one month U.S. tour this Friday in Northern California - catch ‘em where ya can! We had the honor of hosting Jazz Night In America at our GroundUp Music Festival this past year. Listen to their highlights on Yay Yennings, Béla Fleck and the Flecktones, Bill Laurance and more. Bokante is winding up for a string of European dates this Summer and preparing their next release! In the meantime, listen to this gem from their first record here! You can find all their tour details here! Check out Forq's previously unreleased video of Stannic from the Thrēq recording session. They’ll be playing this live in Europe next week with Henry Hey on Keys, Chris McQueen on Guitar, Jason "JT" Thomas on Drums, and Kevin Scott on Bass. Roosevelt Collier Sets Out On His First European Tour! Roosevelt Collier is heading to Europe with his band for the first time! Catch this powerhouse of a musician all over Europe! Alina Engibaryan Releases Video For "We Are"
Alina Engibaryan recently released a live version of “We Are," from Atlantic Studios featuring Kendrick Scott, Chris Potter and Michael League! Roosevelt Collier Band Announces UK Dates! PRD Mais Releases Video For "Hop 63"
PRD Mais released the video for "Hop 63" today! Check out the video here and catch them at their upcoming shows in Brazil! Roosevelt Collier Releases Video For "Happy Feet"
Roosevelt Collier released his new video for "Happy Feet", leading up to his NYC Album Release Party next Monday! "Due to unforeseen circumstances beyond our control, we have no choice but to cancel the upcoming Bokanté May tour. To all the fans that have bought tickets, please contact the venue for a refund. Thank you for the continuous support, and we promise to come back as soon as we can. For now, we’ll be in the studio finishing the mix for our 2nd record." Bokanté Releases Video for "An Ni Chans"
Ahead of their upcoming tour, Bokanté has released another video from "Strange Circles"
Soak in the beautiful weather and dance to the joyful "An Ni Chans!" It's a big day for PRD Mais! Their latest video, "Cabuleto/Batalhão/Bossanta," is out and you can now own the entire "Rittenhouse" Film on Vimeo! The Puppies are hitting the road in a big way this Summer! Catch 'em where you can! French friends! TSF JAZZ radio station was in Miami with us last February at GroundUp Music Festival: listen to the awesome interviews of Michael League Plays Music, Sirintip, Banda Magda, Alina Engibaryan... and the live performances of Roosevelt Collier Music, Alina Engibaryan, Bill Laurance and Snarky Puppy! In case you missed it, Premier Guitar featured Snarky Puppy in their Rig Rundown series! Find out what gives Michael League Plays Music and Mark Lettieri Music the funk in the full video here! Roosevelt Collier Releases Full Length "Exit 16" Today! The day has arrived and the Doctor is in! It's time to let loose and jam to all of Roosevelt Collier Music's killer tunes! In honor of International Women's Day, Banda Magda released the video for "Reine de Bois" (Queen of Wood) off of her record "Tigre." This song features several incredible women musicians including Women of the World on vocals, Maeve Gilchrist on harp, Mika Mimura - Marimba Vibraphone Mallet Keyboard on vibes and Leni Stern on ngoni. Last year Lucy Woodward was asked to perform with the Tiptoe Bigband in Denmark. What resulted is quite incredible! Check out her performance of “Ladykiller” with the big band backing her here! Downbeat Magazine recently debuted the live studio version of Alina Engibaryan's track "I'll Be Around!" Roosevelt Collier Release Second Single "Supernatural Encounters"
Get your dancing shoes on! Roosevelt Collier Music is back with the second single from the upcoming "Exit 16" and it's an absolute party. Catch Rosie grooving with Michael League Plays Music, Jason Thomas, and Bobby Sparks! Alina Engibaryan Releases Record "We Are" Today! Today, we are happy to announce that Alina Engibaryan has released her album "We Are!" For this record she teamed up with Snarky Puppy members Michael League, Larnell Lewis, and Maz to create a beautiful Jazz experience. GroundUP Music Festival Schedule Announced! With an intimate capacity of approximately 1500, no overlapping sets, and excellent acoustics, GroundUP Music Festival boasts a progressive global fusion of jazz, funk, folk and electronic sounds. Fans have the opportunity for intimate masterclasses and workshops including a conversation between bass heavyweights Victor Wooten and Michael League, learning genre bending with Robert Glasper, songwriting with The Wood Brothers and A capalla on the beach led by Banda Magda along with personal interactions with the festival artists who stay all weekend long. The best part? These are all included in the price of your ticket! Roosevelt Collier Releases First Single "Exit 16"
Roosevelt Collier Music just put out their blistering first single. This is dirty groove music at it's finest. Watch some of the best musicians show you how it's done here! Robert Glasper will be hosting his own workshop at GroundUP Fest! The piano genius will discuss genre-bending and how he's used to it through his own music. Sirintip's First Single, "Shut It Up" is out! Today, Sirintip released "Shut It Up," first single from her upcoming full length, "Tribus." Crazy vocal effects, dirty synths and a huge chorus. What more could you ask for! Celebrate the release with Sirintip at Rockwood Music Hall tomorrow night at 7pm! The wait is over! The daily schedules and late night line-ups for GroundUP Music Festival 2018 have been announced! Don't miss your favorite artists! Start your year off with an incredible show! On January 14th, GroundUP Music and Royal Artist Group are taking over DROM for a night of music featuring Becca Stevens, Lucy Woodward, Forq,Ghost-Note, and Yotam Silberstein. GroundUp Music Festival's First Workshop Announced! The first interactive workshop at the GroundUp Music Festival has been announced. Make sure you're following their page to see when the rest are announced, along with the day by day schedule! FORQ Announces February 2018 Tour! FORQ just announced their February tour following GroundUP Music Festival in Miami! If you don't own our debut album Strange Circles yet, now's the time! Buy a vinyl, CD, or digital download and receive 25% off using the code "BOKANTE". We Like It Here is Back! We heard you....We Like It Here is back! Read the statement from Michael League below. We know this has been the topic of conversation for a while now. We recently repressed a limited edition of vinyl (with a free digital download of the OnDemand film and MP3's) for our record We Like It Here. As of today, it is now available for pre-order in our North American and European store. We also just put the feature film with bonus features up on Vimeo, so you can rent or buy it digitally in high definition. In addition to this, we have also redelivered We Like It Here to all streaming and digital platforms, including Spotify and Apple Music. While we still feel that the streaming model is not yet compensating artists fairly, the bottom line is that we care more about reaching our listeners than selling records. This ultimately affects what kind of records we can make and how often we make them, but I think it's worth it at this moment in time. That said, we are at a point in our career (after almost a decade and a half of music making) in which we can carry on without selling albums the way we used to. We actually make money on tour. We sell merch. We sell sheet music. Though we do feel the hit of loss of album sales, we're fine with our alternative revenue streams and we can survive. Many artists- many artists you LOVE- can not. So, for those of you with the desire and means to support artists, I humbly encourage that you buy their music. Physical, direct digital download (which you can now import into streamers like Spotify)... anything helps. You wouldn't believe how many incredible musicians I have spoken with over the last few months who are desperate about their situations right now. Thinking about quitting. Living on friends' couches. These are artists you know, and who you probably think are doing well for themselves. But of course they will never show this side- their struggles, their deep internal battles, their disappointments- on social media. So please, use streaming to discover artists. Then go the extra (very easy) step and help them make more beautiful music by buying it. Thank you for reading. Today is the first date of Charlie Hunter's year ending tour. Catch his incredible Trio while you can! PRD Mais Unveils video for "Vivo Grilo/Bora Bira"
The latest PRD Mais video consists of two of the tracks from their latest record, "Rittenhouse." The video opens up with "Vivo Grilo," a dual tamborim track, and continues on to "Bora Bira" a song that includes the legendary Carlos Malta on Bass Flute and Snarky Puppy's Chris Bullock on Flute. Banda Magda Release "Le Tigre Malin: Reprise"
Brighten your day with this beautiful musical interlude by Banda Magda! Maz just dropped episode 2 of "Maz Flips The Script," a series in which he takes his songs and, with the help of some talented friends, reworks them. This episode feature a smooth and vibey version of "Come On Sista"
The latest Breastfist video is a heartwarming collection of memories with an incredible cat set to a funky electro track filled with flutes and synths! Snarky Puppy's 2018 North American Tour! We’re beyond excited to announce Snarky Puppy’s 2018 North American Tour! After the Second Annual GroundUP Music Festival in Miami from February 9-11, 2018, Snarky Puppy will begin a cross-country tour in the United States stopping cities including Nashville, Portland, Seattle, Boulder, Denver and Los Angeles. The tour starts with 2 nights at in Atlanta and concludes with 4 nights at SF Jazz in San Francisco. Fellow GroundUP artists including Forq, Banda Magda, Sirintip, and Alina Engibaryan will be opening up for the pups throughout the tour. Buy the album here or here. It's real, it's live - February 9-11, 2018. Find out more and get your tickets at http://festival.groundupmusic.net. Breastfist's new album AMUSE DEUCE is FINALLY HERE! Listen to the band Michael League calls "the best live act in the UNIVERSE." Watch the video for "Dried Fruit." Snarky Puppy in South America! Check out Maz in the first music video off his latest release - "Dreamaway"! Banda Magda "Tigre" release week ! Come celebrate the release of Banda Magda new album TIGRE! and Saturday 16 at 40 Street Summer Series in Philadelphia ! That's a week from Friday! Banda Magda's "Muchacha" Video Out Today! Snarky Puppy tour dates ! Last U.S. tour dates of the year, and for the first time in Minneapolis! All-star band Forq releases their third album - Thrēq, today on 180g vinyl and digital with a full video of the sessions! This instrumental quartet has an aggressive sound and a penchant for sonic exploration. On Thrēq, they continues to push further down the sonic rabbit hole with the stunning new material on Thrēq. On this record, the group sound draws from various musical paths of its members, whether it’s Jason’s swampy grooves and shuffles, Chris’ singular sonic approach to guitar, Henry’s zeal for unique keyboard sounds and twisted ear candy, or Michael’s driving world-influenced grooves. Forq Releases Second Single, "Cowabunghole"
Forq just released the second single from their forthcoming record, "Thrēq." "Cowabunghole," written by Chris McQueen and titled by Becca Stevens, is a surfy jam that brings to mind early 60s surf rock with a modern spin. Perfect for Summer listening! Banda Magda is back with the second single from their forthcoming album, "Tigre." On "Tam Tam," the group creates a rich and dense sound through utilization of various orchestral and worldly instruments such as a harp, violins, and accordion, in addition to the standard western instrumentation of drums, bass, and guitar. This upbeat track is sure to bring a smile to your face and lighten up your day! Listen to "Tam Tam" here! Keep up to date with what's happening with our artists through this new weekly video series! The new album from your favorite supergroup Forq is coming August 4. Reserve your copy today and pre-order it now! After a wonderful start to their first world tour in North America, Bokanté heads overseas for the remainder of their dates. See where they'll be and get tickets here! Watch their latest video, "Vayan," here! After a residency at the Cotton Club in Japan, Bill is headed to Europe for a string of July shows! "Strange Circles" is out today! Today is the day! Bokanté's debut album, "Strange Circles," is out (with a 2-month tour starting next week). We are happy to announce that Banda Magda's newest record, "Tigre", will be released in September 2017 on Verve Music Group/GroundUP Music! FORQ - Batch (CD/DVD) Available Everywhere! FORQ's record, Batch [CD/DVD], is available everywhere today! Bokanté's Summer tour dates have been announced along with their second video, "Nou Tout Sé Yonn”. This is no side project, it is a new group formed by Snarky Puppy leader, Michael League and has already been described as “nothing short of a world music supergroup” (Pulse). The word bokanté means “exchange” in Creole, the language of vocalist Malika Tirolien’s youth growing up on the Caribbean island of Guadeloupe. Now living in Montreal, she stands among 8 musicians from 4 continents, each one accomplished in their own right and well versed in music far beyond that of their point of origin. Three-time Grammy award-winning guitarists Michael League, Chris McQueen, and Bob Lanzetti (all from Snarky Puppy), percussion legend Jamey Haddad (Paul Simon, Sting), pedal and lap steel virtuoso Roosevelt Collier (Lee Boys, Karl Denson), and unplaceable percussionists André Ferrari (Väsen) and Keita Ogawa (Banda Magda, Yo-Yo Ma) come together to create a diverse ensemble rich in groove, melody, and soul. Becca Stevens' new album, "Regina", is out now! You're going to want to hear this. Get it on iTunes, buy the physical CD, or get it on Amazon! Take a look at Becca Stevens' second video, "Well Loved", from her upcoming album, "Regina"! Well Loved features the amazing Laura Mvula. The two of them together created one beautiful song! Listen & watch here. The Queen Mab music video is here! The first music video from #ReginaTheAlbum is out for the world to see and it is beautiful! Enjoy Queen Mab by Becca Stevens- Watch here. Michelle Willis' Winter Tour Includes Some Special Guests! Michelle is bringing along two awesome GroundUp singer/songwriters with her to perform at some shows during her Winter Tour. Becca Stevens & Maz. Yup! Ya don't want to miss it. Tickets here! Bill Laurance just finished his US tour and it was AMAZING. Now he's about to head out and do some gigs all over Europe, starting with his neck of the woods, the UK! Don't miss 'em! Tickets here. First listen to Queen Mab off of Becca Stevens new album, Regina, is up NOW on NPR Music. Snarky Puppy's own Bill Laurance is coming to the US! Bill Laurance will be here starting late January to do some shows for ya'll on the East Coast! He'll be making his way down to our GroundUp Music Festival before he heads back to the UK to finish up the rest of the tour. Grab tickets here! House Of Waters are on their Winter Tour! House Of Waters are in the middle of an awesome Winter Tour! After Winter Jazzfest, they'll be making their way to the West Coast, then they'll be back on the East Coast for our GroundUp Music Festival in Miami! Check 'em out. Tickets here. Live At Union Chapel is Available NOW! Bill Laurance's CD/DVD "Union Chapel" is available now on iTunes, Amazon, and you can grab copy the physical at our store! Hang with Snarky Puppy At The Havana Jazz Plaza Festival! Hang out with Snarky Puppy this December at the Havana Jazz Plaza Festival! A trip to Cuba, music from Chucho Valdes, Roberto Fonseca, Terence Blanchard, Christian McBride, Arturo O'Farrill and Fatoumata Diawara, a meet-n-greet with us, and much more. Get the whole package right here! David Crosby's "Lighthouse" is Available Everywhere! On October 21st, David Crosby released his brand new album "Lighthouse". David worked with a few great singer/songwriters on this album including, Michael League, Michelle Willis and Becca Stevens. "Lighthouse" was produced by Michael League. JazzTimes premiered Bill Laurance's new video for "Swift" last week! Click here to check it out! If you preorder Union Chapel on iTunes you'll receive the song instantly! You can also preorder Union Chapel on Amazon & at our Store! Maz "Idealist" is Available NOW! Maz's "Idealist" is officially here and available on iTunes, Amazon, & physically! Maz officially announced his upcoming Fall Tour and Album Release Party! "Idealist" will be available worldwide on October 14th, but he will have physical copies available at the Album Release Party at Club Bonafide on October 8th! Grab your tickets here. October 20th at The Ardmore Music Hall: Roosevelt Collier's Philly Get Down feat. Michael League, Mike Greenfield (Lotus), and Rob Compa/Eli Winderman (Dopapod) with Johnny Showcase opening! NY Times Fall Preview featuring "Lighthouse"
The NY Times Fall preview features a great write-up on David Crosby's Lighthouse. "Lighthouse” is an interior but proudly restless statement, a mostly acoustic singer-songwriter album that bathes Mr. Crosby’s voice and guitar in a warm, clear light. Click here for the full list and more on Lighthouse. "Take 5 with Michael League..."
Bryon Bay Bluefest sat down with Michael League of Snarky Puppy and discovered his 5 biggest music influences! I don’t have a car, but the song I’m listening to the most right now at home is a song called ‘Dying Star’ from Maz’s ‘Idealist’ record. He’s actually a member in Snarky Puppy, but he has a vocal project as well and a beautiful record out October 14th. Charlie Hunter will be live at Drom NYC on September 17th with the quartet of Bobby Previte, Kirk Knuffke, and Curtis Sonny Fowlkes! Vernon Reid and Charlie will be talking music, interviewing each other, and jamming out. Hosted by GroundUP Music- Hope to see you there! New House Of Waters Tee available! Bill Laurance's video for 'Aftersun' is finally here and it's beautiful! Click here to check it out. NPR Music Premieres "The City"
NPR Music premiered David Crosby's new record , "The City", and did an amazing review. When those rich layers of complex vocal harmony kick in, all the lush, luminous qualities that can make the city so seductive are instantly underlined. Listen & read the article. House Of Waters release their debut album! It's been a long time coming, but House Of Waters finally released their beautiful creation out into the world! "House Of Waters" is available, digitally, physically, and through Amazon. Enjoy! David Crosby had a chat with The New York Times about life and recording his new album ‪#‎Lighthouse‬. Read, watch, and listen here. The Guitar Channel interviewed Charlie Hunter, at the Montreal Jazz Festival just before his set. Check it out here at theguitarchannel.biz. If George Duke and Bernie Worrell have an heir, it's this young and playfully funkified virtuoso, who's been playing gospel in church since he was four. Check out the article here at villagevoice.com. "Deep in the heart of Texas they grow the funk pure and rich with an ancient group of ingredients of which the Funky Knucles wrote the cook book” - Dallas Morning Star. The new album from The Funky Knuckles, New Birth is available this Friday, June 10! Pre-order the CD today! Use the code RJD1UW8V01KZ at checkout to download it for free! Bill Laurance chats with Ken Navarro about "Aftersun", previous records, being on the road with Snarky Puppy and more! Check it out below! Snarky Puppy wants to hear your original songs using samples from the song "Tarova" off their latest album Culcha Vulcha. We've provided a sampling of one shots and loops as well as a download of the full, extensive sample pack for you to rework in your own unique track. Snarky wants to hear all styles of music and with the wide ranging sounds available in this high quality sample collection, the possibilities are endless. Show us your best work! We need your help spreading the word. Covert operations in the name of music, community and love. Apply with Jamie and prepare for your mission. We want YOU as our newest recruit. Relix Magazine has an exclusive new video featuring our own Cory Henry playing Lord Give Me A Sign live in their own studio. Catch him on The Revival Europe Tour, starting May 12 in Dublin, Ireland. Michael Ross of Guitar Player Magazine recently sat down with Bob Lanzetti, Chris McQueen, and Mark Lettieri of Snarky Puppy. Check out the article here, where the guys talk listening, gear, and the dynamics of a sometimes three-guitarist band. The Hammond's emotive swells involve some complex manipulation. Players create sound at the keyboards using a spaceship's worth of job draw bars, buttons and pedals. Now in his 20s, Henry can glide through just about any gospel song on the Hammond with the ease of someone taking the family car out for a Sunday drive." Three members of the GRAMMY-winning collective Snarky Puppy — bandleader Michael League, keyboardist Bill Laurance, and drummer Robert “Sput” Searight — took a moment from their busy SXSW schedule to talk to GRAMMY Pro about their genre-defying music. The trio spoke about their GRAMMY-winning collaboration with the Metropole Orkest, the second installment in the Family Dinner series, and their latest studio album, Culcha Vulcha. GroundUP Music recording artist Lucy Woodward jumps on the Snarky train for five nights this spring. Come and hear her sing! Not near? No fear - Lucy’s GroundUP Debut might be the soundtrack to your summer. This Sunday at 10pm GMT you can hear the very first play of Snarky Puppy’s new album Culcha Vulcha (due out April 29) and also tune into legendary UK radio man Mike Chadwick sign off on his last show on Jazz FM. Click here to listen live! Pre-order the physical edition or the digital (iTunes) edition of Culcha Vulcha today. Congratulations Snarky Puppy! The band is nominated for Album of the Year at the JazzFM Awards! Tune in live on April 26th to support the pups and don't forget to cast your vote here. NYC! Don't miss master guitarist and Family Dinner, Volume Two guest Charlie Hunter at Rockwood Music Hall March 17th-19th. Tickets available here! Catch him live performing with your favorite drummers: March 17th with Bobby Previte, 18th with Louis Cato, and the 19th with Adam Cruz. "It has the beautiful, simple, poetic lyricism that I love about David's writing. And most of all, the song and the performance itself are so vulnerable. ...Many artists fight against this as they age, but Crosby has embraced it. In my opinion, he's writing the best music of his entire life right now." "Sometimes it's ‘Oh, my dad told me about you,' and sometimes it's ‘Oh, my son told me about you,'" he said. "It's funny. And you know, jazz, jam band, fusion: I don't know where we are. But because the band has such a rapport — from 12 years of touring, over 1,200 concerts, 11 albums — our mix of styles doesn't sound disparate. It just sounds like Snarky Puppy." Aftersun, Bill Laurance's third solo record will be released March 4th! It's up for pre-order now, and when you get it on iTunes you will instantly get "Soti".Preorder the digital version, or reserve your physical copy here. The Revival is officially up for pre-order! The record won't be released until 3/18, but you can pre-order it on iTunes and instantly get "NaaNaaNaa". Or, pre-order the physical copy here. Family Dinner 2 Out Now! Sylva, Snarky Puppy's album from 2015 is up for "Best Contemporary Instrumental" Album at the Grammy's this Monday! Tune into the pre-show to support the pups, or follow us on social media... we will be sure to blast it out. Marcelo Woloski's Kickstarter: Mundo por conocer - My debut album! Long-time Snarky Puppy percussionist sideman Marcelo Woloski has launched a kickstarter to fund his debut album-- check it out, and contribute to this oh-so-worthy cause here. My debut album features my original music, over 25 amazing musicians and lots of percussion! Please help me make this dream come true! Snarky Puppy's own Bob Lanzetti has some upcoming shows as part of the amazing Red Eyed Sinatra! If you're in New York City (2/19) or Bethesda, Maryland (2/24) come check it out! Click here for tickets to the New York show, or here for tickets to the show in Bethesda. Red Eyed Sinatra also features Steve Jenkins on bass and Devin Collins on drums. Snarky Puppy is finally coming to the big screen in uncompressed 24-bit 48kHz 5.1 Dolby Digital surround sound and in a 4K resolution. We've hand-picked theaters that have a great vibe and that have been held to the highest technical standards so the recording can be seen and heard exactly as it was intended in the studio. Special appearances from Directors Michael League and Andy LaViolette, surprise guest artists, and other members of the band will be at select locations. Tell your friends! 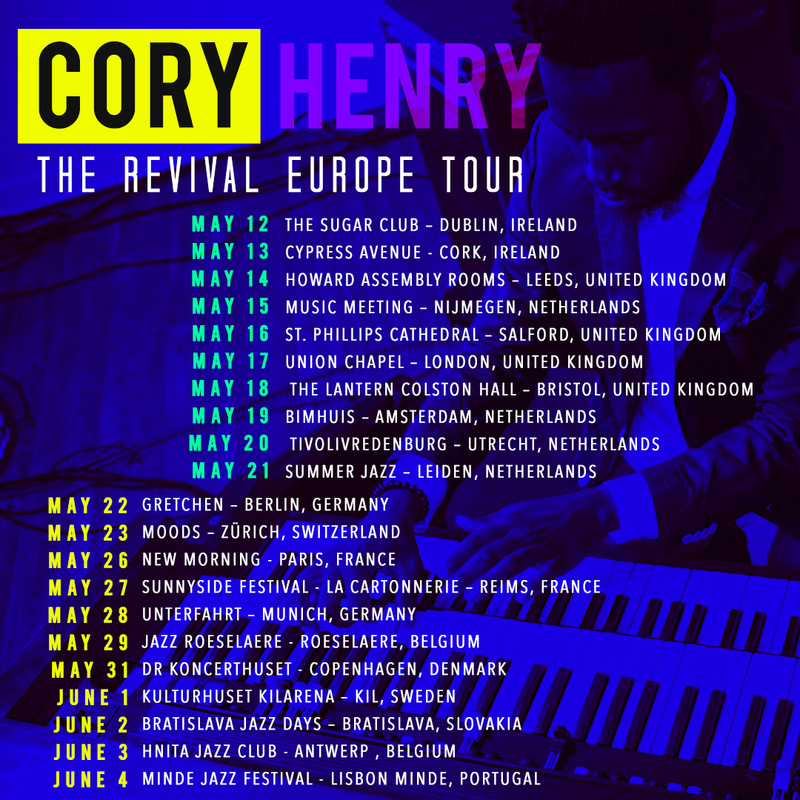 Cory Henry takes a nostalgic journey back to his home church with "The Revival: Live Recording"--an ode to musical greats who have influenced the sound of music over the decades, and a professional snapshot of Cory's discography. This record commemorates icons and the "NY Sound" founding fathers. This project features the organ, Henry's first instrument, which has a rich tradition spanning from the 1940s. Noting that it doesn't get as much recognition today, Cory wants the audience to not only experience the organ from a gospel perspective, but to appreciate its contribution to music in general. Aftersun shines on Ground UP Music this spring as the Grammy Award winning pianist brings his 3rd recording to life. For the third instalment, the music is filtered down to its roots featuring the original trio of Snarky Puppy's own Michael League and Robert Sput Searight with legendary New Orleans percussionist Weedie Braihma. Dance and African Percussion at its heart, the album combines deep world grooves with Laurance's signature genre bending exploration. Snarky collaborator and GroundUP artist Michelle Willis heads west to Ontario on October 15th for Folk Music Ontario. If you're anywhere near make sure to say hey. Snarky keyboard all-star Cory Henry packs up his Funk Apostles and takes them over to Europe for the month of November on a people's instinctive travel through funk and rhythm. Get your Tickets here: http://www.bandsintown.com/CoryHenry. Thanks to our partners at nugs.net we have a litany of live Snarky Puppy shows fresh off their first leg of Word Tour 2015. The band is absolutely on fire, burning down the house nightly. Check for yourself - get some Austin, Atlanta, New Orleans and more. Ase Me Na Bo: "Your gaze is glass, turquoise porcelain..."
Banda Magda shares a rough mix of Ase Me Na Bo with lyrics, an English translation, and videos from the session. Keep your eyes on us for more TIGRE updates! See what drummer Larnell Lewis Music (Snarky Puppy) does with Promark's Rebound sticks in this new video. Banda Magda has been busy busy touring and traveling the world this summer. We are anxiously awaiting their next album, Tigre, and would like to invite you to be a part of it. Snarky Puppy's Michael League compiled a playlist of gateway drugs that led him to really love - dare I say, get addicted to - adventurous music, like jazz. Administer auditorily. No lethal dose, but beware of strong effects. Snarky Puppy World Tour 2015 Dates Announced! Check them out here. Brooklyn Comes Alive on September 26 with an illustrious lineup of all star musicians who will take over the borough from about noon to 4am a la Frenchman Street in New Orleans. For more information and tickets, click here. The Ultimate Bass Camp sounds like a super badass name for what will probably be a super badass few days with Michael League Plays Music. Take your summer (and your bass skills) to 11 by registering today. PS: Ultimate Drum Camp is also a thing. Music education for the win! Get on up to Brooklyn Bowl on Tuesday, August 18 for a night of soulful blues. This horn section is blazing: Chris Bullock on sax, Natalie Cressman Music on trombone and vocals, and Jennifer Hartswick on trumpet (aka "turmpet") and vocals. Elise Testone, who wowed crowds at the James Brown Dance Party, celebrates B.B. King this time around. Please join us in celebrating Eric Hartman at a Benefit Concert in his honor at Dallas's Granada Theater on August 25. He was a beloved member of the Snarky Puppy family and is sorely missed. Performances by David Crosby, Snarky Puppy, Becca Stevens, The Funky Knuckles, Shaun Martin, and more. Tickets available now. The Tour de Philthy. Coming to a city near you in September. Philip Lassiter, master trumpeter and bandleader, recently announced his Tour de Philthy. This man is funky, fresh, and always in good musical company. Get on up to Villain & Saint, The Sutler, Flying Saucer Memphis, Natasha's Bistro & Bar, or Aisle 5 in September to join the party. Robert Sput Searight and Nate Werth are on tour debuting their new side project, Ghost-Note. World renowned for their artistic communication through rhythm, this dynamic duo expands their percussive voice into a night of melody through innovative grooves and captivating artistry. Joining them on stage are Nick Werth (Xylo-synth), Sylvester Uzoma Onyejiaka II (Sax), and A.j. Brown(bass). This is a night of music you don't want to miss. Check their tour schedule for details and don't forget to follow them for updates. Live vicariously through Brighton's Finest's review of the Bill Laurance Project - Check it out. The whole band seemed to be at one with their music, and their enjoyment in playing was so obvious. Throughout the show, the audience where amazed by the impeccable quality of the sound and ingenuity of the band. They managed to blend multiple genres into their loose Jazz Fusion format, making for an impressive and memorable concert that never dulled, and left the entire audience in gleeful adulation as they stood applauding in ovation, knowing they had witnessed masters of their craft producing exceptional music.